Did you know that one in ten people will have a kidney stone over the course of a lifetime? Recent studies have shown that kidney stone rates are on the rise across the country. Those in the know believe that some major misconceptions may be the culprit. The National Kidney Foundation has teamed up with Dr. Allan Jhagroo, a kidney stone specialist at the University of Wisconsin School of Medicine and Public Health, to help you stay stone-free by debunking some of the major kidney stone myths and misconceptions. Here are the top 6 kidney stone prevention tips: Don't Underestimate Your Sweat. Saunas, hot yoga and heavy exercise may be good for your health, but they also may lead to kidney stones. Why? Loss of water through sweating - whether due to these activities or just the heat of summer—leads to less urine production. The more you sweat, the less you urinate, which allows for stone-causing minerals to settle and bond in the kidneys and urinary tract. Instead: Hydrate with H2O. One of the best measures you can take to avoid kidney stones is to drink plenty of water, leading you to urinate a lot. So, be sure to keep well hydrated, especially when engaging in exercise or activities that cause a lot of sweating. It's Not Just the Oxalate. Oxa-what? Oxalate is naturally found in many foods, including fruits and vegetables, nuts and seeds, grains, legumes, and even chocolate and tea. Some examples of foods that contain high levels of oxalate include: peanuts, rhubarb, spinach, beets, chocolate and sweet potatoes. Moderating intake of these foods may be beneficial for people who form calcium oxalate stones, the leading type of kidney stones. A common misconception is that cutting the oxalate-rich foods in your diet alone will reduce the likelihood of forming calcium oxalate kidney stones. While in theory this might be true, this approach isn't smart from an overall health perspective. Most kidney stones are formed when oxalate binds to calcium while urine is produced by the kidneys. Instead: Eat and drink calcium and oxalate-rich foods together during a meal. In doing so, oxalate and calcium are more likely to bind to one another in the stomach and intestines before the kidneys begin processing, making it less likely that kidney stones will form. Calcium is Not the Enemy. But it tends to get a bad rap! Most likely due to its name and composition, many are under the impression that calcium is the main culprit in calcium-oxalate stones. "I still see patients who wonder why they are getting recurring stones despite cutting down on their calcium intake," said Dr. Jhagroo. "I've even had patients say that their doctors told them to reduce their calcium intake." A diet low in calcium actually increases one's risk of developing kidney stones. Instead: Don't reduce the calcium. Work to cut back on the sodium in your diet and to pair calcium-rich foods with oxalate-rich foods. It's Not One and Done. Passing a kidney stone is often described as one of the most painful experiences a person can have, but unfortunately, it's not always a one-time event. Studies have shown that having even one stone greatly increases your chances of having another. "Most people will want to do anything they can to ensure it doesn't happen again," said Dr. Jhagroo. "Unfortunately, it doesn't seem to be the case that people make the changes they need to after their first stone event." Research conducted by Dr. Jhagroo shows that those with kidney stones do not always heed the advice of their nephrologists and urinary specialists. About 15% of kidney stone patients didn't take prescribed medications and 41% did not follow the nutritional advice that would keep stones from recurring. Instead: Take action! Without the right medications and diet adjustments, stones can come back, and recurring kidney stones also could be an indicator of other problems, including kidney disease. When Life Hands You Kidney Stones… don't fret. And as the saying goes, "make lemonade." It's important to consider dietary remedies alongside prescription medications. While it may seem easier to just take a pill to fix a medical problem, consider what lifestyle changes will also make a big impact on your health. Instead: Next time you drive past a lemonade (or limeade) stand, consider your kidneys. Chronic kidney stones are often treated with potassium ci trate, but studies have shown that limeade, lemonade and other fruits and juices high in natural citrate offers the same stone-preventing benefits. Beware of the sugar, though, because it can increase kidney stone risk. Instead, buy sugar-free lemonade, or make your own by mixing lime or lemon juice with water and using a sugar substitute if needed. "We believe that citrate in the urine may prevent the calcium from binding with other constituents that lead to stones," said Dr. Jhagroo. "Also, some evidence suggests that citrate may prevent crystals that are already present from binding with each other, thus preventing them from getting bigger." Not All Stones are Created Equal. 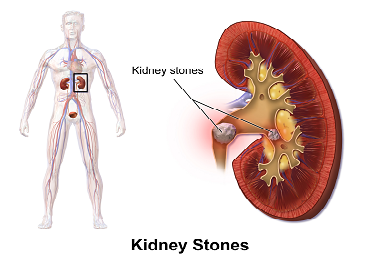 In addition to calcium oxalate stones, another common type of kidney stones is uric acid stones. Red meat, organ meats, and shellfish have high concentrations of a natural chemical compound known as purines. "High purine intake leads to a higher production of uric acid and produces a larger acid load for the kidneys to excrete," said Dr. Jhagroo. Higher uric acid excretion leads to lower overall urine pH, which means the urine is more acidic. The high acid concentration of the urine makes it easier for uric acid stones to form. Instead: To prevent uric acid stones, cut down on high-purine foods such as red meat, organ meats, and shellfish, and follow a healthy diet that contains mostly vegetables and fruits, whole grains, and low fat dairy products. Limit sugar-sweetened foods and drinks, especially those that contain high fructose corn syrup.